The key to eBay selling is to get the buyer in your shop and keep them there. If they leave because they can’t find what they want, or they don’t consider you a serious, professional seller, you will be back at the mercy of the eBay search. The Premium level package features fully customized designs ranging from eBay style layouts to website style layouts – you tell us what you want . All designs are bespoke – we do not use templates so we can create exactly what you want within the constraints of your selected package and eBay rules. We will also supply a matching item listing design. The Premium level package features fully customized designs ranging from eBay style layouts to website style layouts – you tell us what you want . All designs are bespoke – we do not use templates so we can create exactly what you want within the constraints of your selected package and eBay rules. 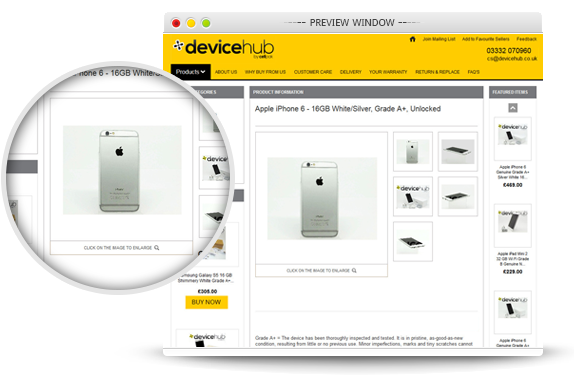 We will create one matching item listing template which can be used to create new eBay listings from a wide variety of platform: eSeller Manager (our own subscription software), Linnworks, Channel Advisor, Bright Pearl, TurboLister and many others. You can also use the HTML code to create descriptions with the design embedded in any free HTML editor for use directly in eBay. 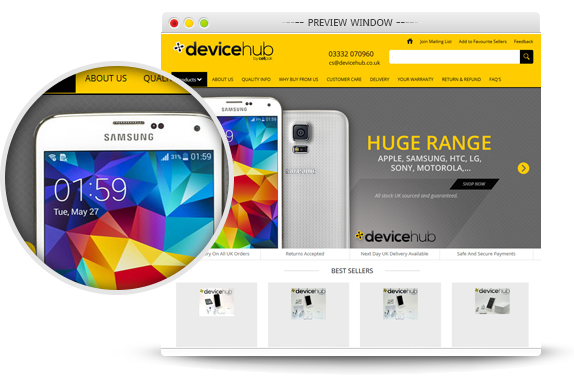 We will create a separate design layout specifically for mobile display. Your design will switch automatically between desktop and mobile views as it automatically identifies the appropriate version to display. The responsive layout is designed to enhance viewing in a mobile device – no need to zoom, simple vertical navigation, optimised for faster loading on a mobile and compatible with the eBay app. If you do not have a logo, we will create a simple text-based logo for you. Our designers will be happy to offer more complex designs subject to quote. Please ask us for details. Your design includes a customized store header with logo , contact information, search box, custom page links. 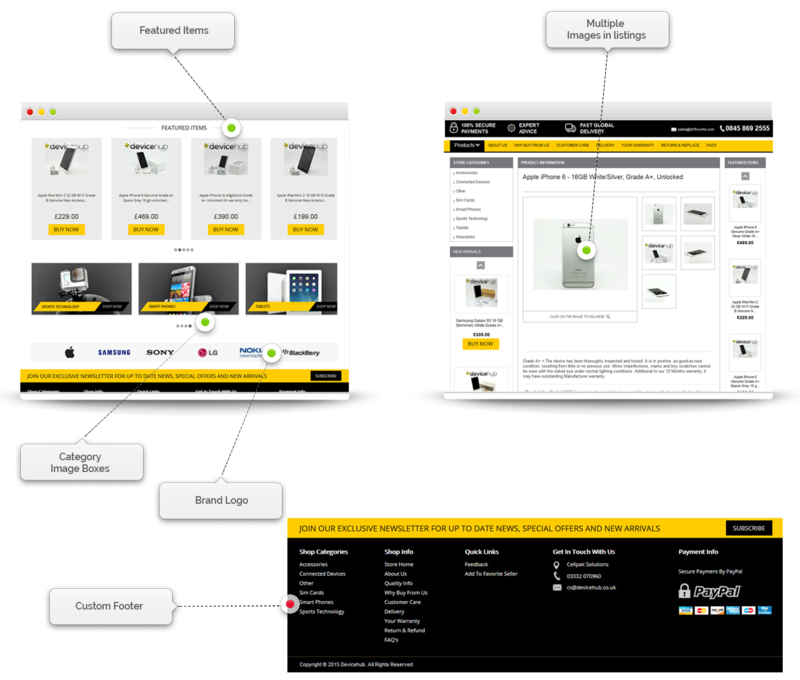 Centralised Main Banner can display up to four images which switch constantly to highlight products, ranges, features and maintain customer interest. Can be hyperlinked to shop categories or sub-categories for specific promotions. eBay Store page links (FAQ’s, shipping information, about us etc) will be incorporated into your header design. The standard eBay search box will be customized to be highly visible within the header design, to encourage customers to search within your shop rather than return to the eBay search. Customers can search for key words in your Titles and Descriptions. 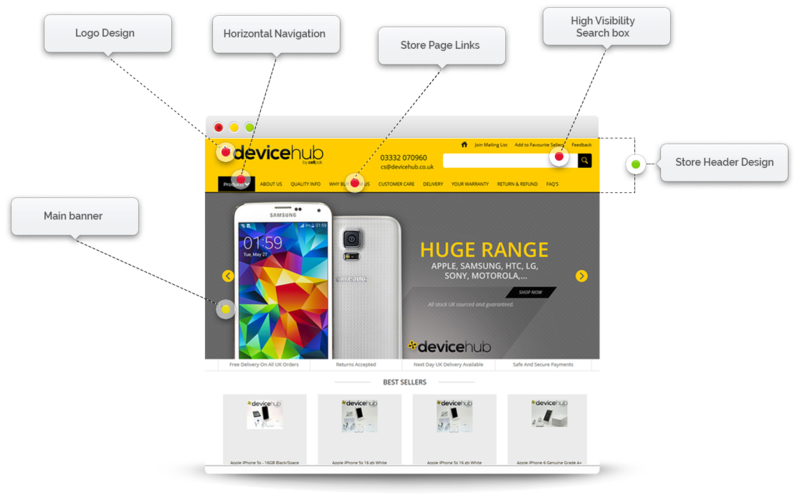 The addition of the horizontal Navigation bar at the top of the shop and listing will help customers to navigate through the store with ease and directs their attention toward specific categories by giving them increased prominence. Clear, easy navigation is designed to keep the potential customer in your store and discourage them from going back to the standard eBay search. Graphics are included for up to three (3) promotion boxes which appear in both the shop and item listings. Use them to advertise the things you consider to be important in your business – free shipping, special offers etc. Can be linked to custom pages in your shop or shop categories. The custom designed store category list displayed on the left side of the shop and item listing helps to speed up navigation through your store and encourages buyers to remain in your store rather than return to eBay’s general search. These categories are based on the categories you created within your eBay shop setup. Dynamic navigation means that when you add or delete Store Categories in eBay they will automatically appear or disappear from your navigation within the design. The display order is based on your own internal settings in eBay’s Manage My Store section. Featured items represent a fantastic opportunity to cross promote your sales items. Featured items are set as default to display randomly from your active listings. This can be managed and changed using eSeller Manager. These boxes allow you to promote/highlight specific shop categories on the main shop page. Each box includes the category name and a category specific image. Maximum of eight (8) image boxes are included in the design. Additional boxes can be added, subject to quote. We create a footer section for your design which adds to the overall impression of a professional website style shop. This section can be used for information about the business, newsletter sign ups, additional cross promotion and so on. These boxes allow you to promote/highlight specific shop categories on the main shop page. Each box includes the category name and a category specific image and will open to a search results page displaying the relevant products. All the positive feedback received from the customers can be collected from eBay for display on the store page. This is a great way to inspire customer confidence. You can manage this feature in your listings using our eSeller Manager software. Encourage buyers to sign up to a newsletter to increase your opportunities for direct marketing and improve your recurring sales. New Arrivals/ Seasonal Items is an exciting store feature designed attract more interest in a targeted product range. You can manage this feature in your listings using our eSeller Manager software. Fantastic feature designed to link specific items in your store to create cross and up sell opportunities. Specific Related Items allows you to target individual products or ranges with highly relevant cross promotions. Please note that this feature requires our eSeller Manager software. Create your listings in any one of these platforms with your new design. We will add the coding to your preferred platform and create the necessary tags to embed the description data fields for seamless listing creation. Once the design coding has been added, you can then create multiple copies, depending on the variations required in the platform. Items marked * can be self-managed via eSeller Manager – our proprietary listing and design management on-line application included in your monthly subscription. Premium Package payment can be split into four (4) equal instalments, subject to agreement. We do not create designs for you that require that you sign up to indefinite contract periods for unspecified future pricing. Instead we have created a design that you can host on your own server and can manage if you have knowledge of HTML and access to an HTML editor (of which several are freely available). For those customers who do not have their own hosting or who are not proficient in HTML coding, we offer a monthly subscription-based application to ensure that you get the full benefit of your new designs. Hosting is necessary, however you are not required to use our service. If you do not have your own provider we can offer this service as part of a subscription or as an annual standalone cost. We create your design and provide you with the HTML coding we create for you, but many of your design aspects can be self-managed using our eSeller Manager application. With this software you can change banner images, promotion boxes and much more without incurring the cost of using our design services after the initial build. Subscription to this software is not mandatory but the functionality provided can save a great deal of time as well as money. This application will allow you to manage your designs and make changes that we would ordinarily charge at our standard rate.